Arts @ Large works closely with school teams (comprised of teachers, administrators, specialists from a variety of disciplines, parents, and student representatives) to monitor a series of key elements in each Arts @ Large school that helps to determine the efficacy of programs, while examining opportunities for ongoing improvement. 1. Teachers, administrators, after school providers and students team with Arts @ Large staff to collaboratively define an overarching issue, idea or concept where arts can be linked to academic content to create an exciting learning environment. 2. Arts @ Large teams identify art forms (music, visual art, theatre, dance, literary arts) that connect to and can enhance teaching the selected topic or concept. 3. Teams seek out, interview and invite artist educators, community service organizations and higher education to partner with teachers and students to create project-based, arts integrated activities. 4. Planning meetings are scheduled with participating teachers and selected partners to define goals and objectives of Arts @ Large projects. 5. Projects are implemented in a collaborative teaching model that involves both the community partners and teachers. 6. 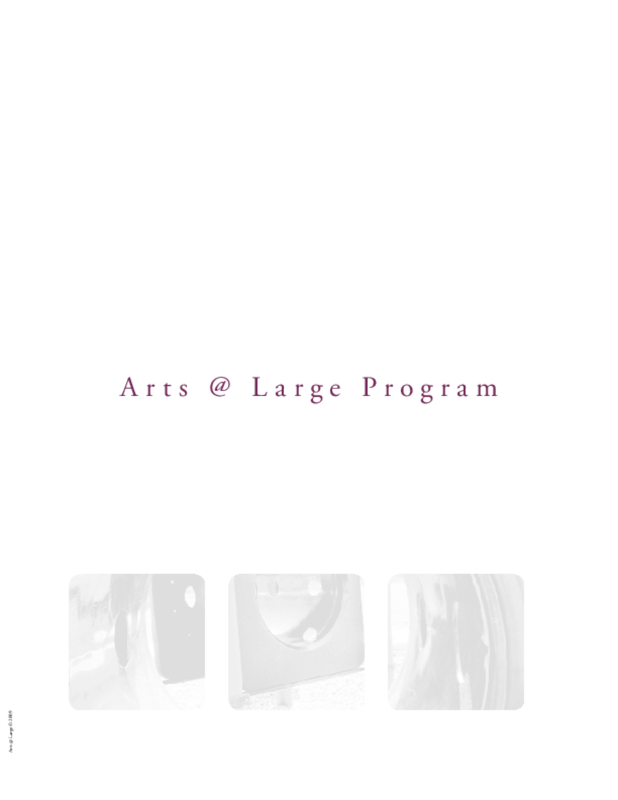 Teams design and provide ongoing assessment of Arts @ Large projects. 7. The school community celebrates the achievements of students, teachers, artist educators, parents and community partners. This section of the handbook describes each of these attributes in more detail. Copyright 2009 Arts @ Large.